Do women want to be treated like Women or treated like Professional? Effective Communication - Speak out - break the cultural upbringing that always taught us that women should be 'seen but not heard', demure, less aggressive, submissive - to one of speak out, and 'be seen and heard'. 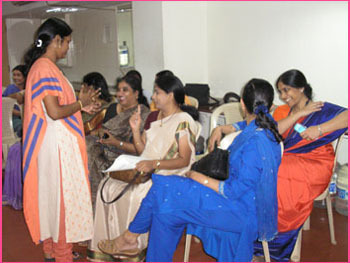 The event was held at Scope e-Knowledge Center P Ltd. Located at Temple Towers, Nandanam, Chennai. Enthusiastic women from member companies such as Alcatel, Scope e-Knowledge Center, and Scope International participated in the event and the interactive session held as part of the event was so encouraging where the young women found it challenging to keep themselves up-to-date with technology and realized the importance of it. ** Kalyani Narayanan has been serving the IT industry for over 20 years. She got her degree in Computer Science from University of Houston. She worked in the US for over 5 years for companies such as Sprint before relocating back to Chennai where she continued her career in IT. She has successfully started two IT firms in Chennai. She has also worked for multinationals such as Covansys.